Recently govt. of India has introduced a new cess on service tax i.e. Krishi Kalyan Cess. This cess has to be charged on services given from June 1st, 2016 onwards. 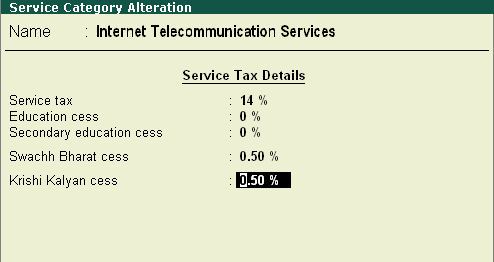 The percentage would be 0.5% on service tax. It would end up the service tax to be 15% which would include service tax 14%, Swachh Bharat Cess 0.5% and Krishi Kalyan Cess 0.5%. 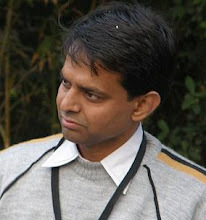 What is Krishi Kalyan Cess ? The Krishi Kalyan Cess KKC is a new cess introduced by union finance minister in his annual budget for 2016-20117. This cess would be levied on all services.This cess would be applicable above and over Swachh Bharat cess and service tax. Krishi Kalyan Cess would be applicable on all the services that may have been provided before June 1, but payments were made on that date or afterwards. In cases where the services have been provided before the said date and the invoice has been raised before 1st June, the cess would be payable. In cases where the services have been provided before 1 june and payment has been received before 1June,there this cess is not applicable. Implementing Krishi Kalyan Cess in Tally.ERP 9 release 5.x onwards is very easy. The only thing you need is to download the latest release of Tally.ERP 9. 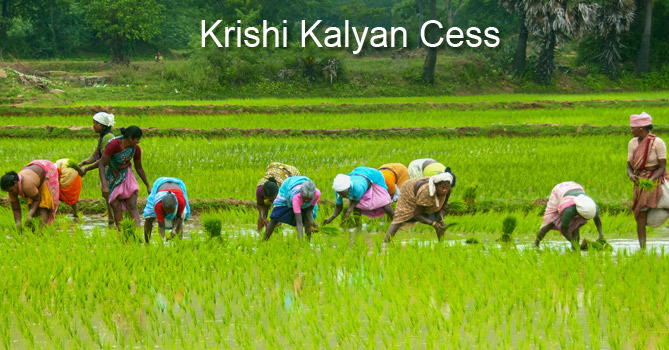 The Krishi Kalyan Cess is implemented in 5.3.8 release onwards. 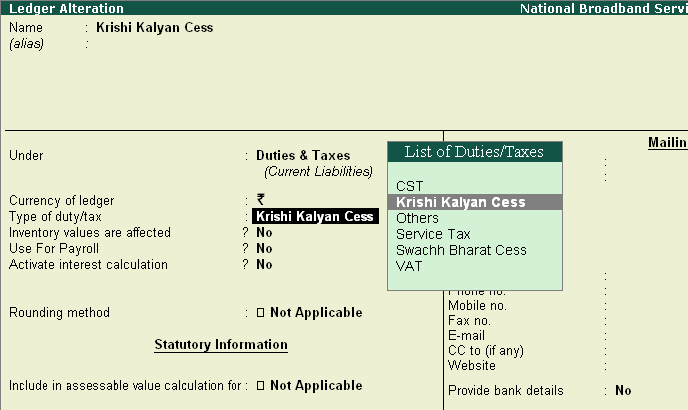 The first step after downloading rel 5.3.8 is to create a new ledger named Krishi Kalyaan Cess under duties and taxes to collect the values there. 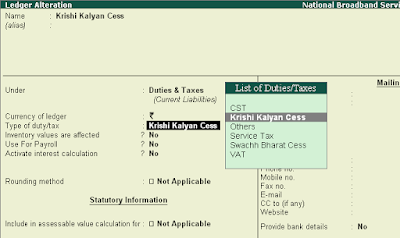 After you have selected Duties and Taxes you would see that a new option has comes up as Krishi Kalyan Cess. Select it and accept the voucher. Check out this video on the same topic which explains the process step by step. That all. Your Krishi Kalyan Cess is implemented in Tally. Just try to put an entry and see if amount is calculated automatically or not. If you face any difficulty then ApniTally is there, put a comment and we would love to help you out. If your Tally Net subscription is expired and you want to implement Krishi Kalyan Cess KKC then you have to update your subcription. Click on the image below and you can update your subscription in few clicks. You can also buy rental Tally or New Tally also.